We, at Bridgewater Performance, believe that there is a bigger picture and that the picture, is more than just sports. Each athlete is unique and needs a secure and stimulating atmosphere in which to mature not only physically, but emotionally as well. It is my aspiration, as a coach, to help these athletes meet their fullest potential in these areas by providing an environment that supports risk-taking, as well as, providing life lessons that are relevant to day to day encounters. With Bridgewater Performance, there is no such thing as failure if you can truly say you gave it 100 percent. However, there is a scoreboard, and sometimes in life we experience defeat. It’s those who bounce back, learn from mistakes, and perfect their overall craft, who will always be on the winning end, no matter the outcome of the game. As a coach, my dream is to instill a passion in each of my athletes to continuously improve their skills and never settle. While I work to instill this passion into my athletes, I also wear my heart on my sleeve, and continue to improve and perfect my craft as well. Our society is becoming more competitive and with that, there is a need for compassionate and dedicated individuals to help shape our nation’s future, starting with our athletes. It is important for athletes to work with someone who is not only aware of this, but also sensitive to their individual needs. I am confident in my ability to deliver my beliefs and instill my “lion mentality” into each athlete. It is my mission to be the best coach, mentor, and role model that I can be. Jonny is a nationally accredited Certified Strength and Conditioning Specialist who works with people from all walks of life to achieve weight loss goals, add lean muscle or achieve overall health. 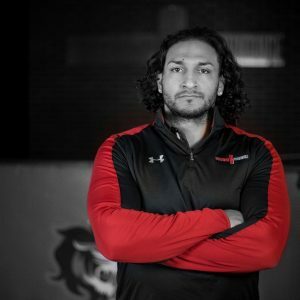 He specializes in helping young athletes take their performance to the next level, working with some of Southeastern Wisconsin’s top high school, middle school and grade school youth. His lifelong exposure to high-level sports and athletics gives Jonny the unique understanding of each athlete’s challenges and goals.